and to leave you wonderful memories of your day. Are you ready to live a unique experience ? Do you attach a great importance TO YOUR MEMORIES ? Does photography have a substantial place in your life? For my part I always had a great sensitivity to photography, to images. I see myself, as a child, flipping through the albums of my parents or grandparents and thus live or relive those happy moments captured forever. Photography took an even more important place at the birth of my children and I realize how these memories are precious for them today. Are you sensitive TO EMOTION ? A tear that flows, the eyes shining... So many emotion will be experienced during this day. 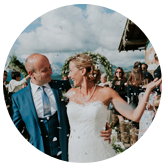 I grant a great importance to the human aspect of my job, so it is essential for me to discuss with you a long time before your wedding in order to weave links, share your happiness, live this day with you and capture all the emotion that compose it. Your memories ON PAPER... Because your photos takes all their meaning on paper, I want to offer you more than digital files so that you can discover the sensations caused by the smell or the texture of paper. A beautiful object that you will transmit. 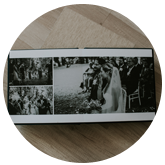 This photo album tailor made just for you and covered by hand in a handcrafted workshop will be delivered with your USB stick. A first appointment during which we will discuss about you, who you are, your expectations and what your wedding represents. If you travel in France (for example to visit your venue) I will bring my camera to take some pictures of you in order to show you how I work. 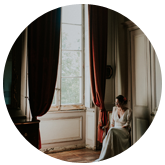 all the preparation before the wedding day (different appointments or calls if necessary…) so that we will no longer be perfect strangers on the D-Day. It also allow us to think about the smallest details and to better prepare your photography experience. And to make your pictures living and let you discover the magical sensations caused by the smell and texture of paper, I also offer you, a fine-art album of 30 pages in 25x25cm format.